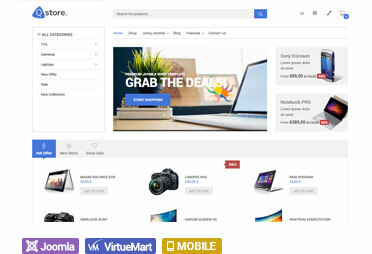 Welcome to the Virtuemart templates website where we design modern, easy to use Ecommerce Joomla templates for Virtuemart. We have been designing high quality templates for over 10 years which are compatible with the latest version of Joomla and Virtuemart. If you’re looking for a professional theme which is easy to use and customize to open a shop for your business download a template at the website today. 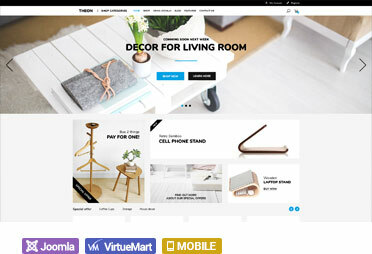 Each theme includes a step by step installation guide to provide you with instructions to setup and install the Virtuemart template at your website. The template website demo installer allows you to easily setup an exact copy of the website and template you can see at our demo website. Build an amazing ecommerce website today using the Theon shop Virtuemart template we have designed for the latest version of Joomla which comes with everything you need to build a successful online store. The Theon shop template is a fully responsive web design to provide your shoppers with a flawless and intuitive mobile user experience. The design can be used to sell a wide range of products. Whether you want to sell fashion items, furniture, books or maybe electrical items the Theon shop design can be easily adapted to help you build your dream website. The theme is simple to setup and easy to customize plus it comes with an array of powerful built-in features. Some of the built-in features Theon shop supports include an image slideshow, customer testimonials module, tons of module positions and typography styles for you to choose support for RTL layouts and a built-in theme customization tool so you can easily customize the template. Studio shop is a modern, responsive Virtuemart template which is the perfect choice of theme to create a mobile friendly ecommerce website to showcase your products in a professional and elegant way. The Studio shop design is easy to setup and customize plus it comes with everything you need to open a store for your business. Studio shop comes with some great built-in features including a choice of 3 unique colour styles for you to choose from, product image slideshow, an eye catching mega menu style, custom sliding product modules, a choice of 60 modules positions, 600+ Fonts to choose from and many more features which you can access using the powerful built-in template control panel. If you’re looking for a hand-crafted web design that comes with everything you need to create a beautiful e-commerce website download Studio shop today. 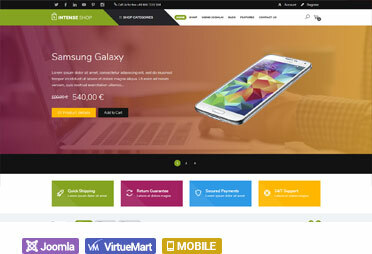 The Intense shop Virtuemart template for Joomla is a modern, stylish, mobile friendly ecommerce web design that focuses on providing your customers with the best mobile shopping experience. It sports a clean, minimalist layout with plenty of white space and greets website visitors with a full-page slider on the home page. A few tastefully designed parallax effects mesh well and create an elegant overall look for your website. The Intense shopping cart theme is fully responsive and easy to use, and you can install the demo website with just one click. The design also comes with some great built-in features including a choice of 3 modern colour styles for you to choose from, product image slideshow, an eye catching mega menu style, custom sliding product module, a choice of 80 modules positions, 600+ Fonts to choose from and many more features which you can access using the powerful, built-in template control panel which allows you to easily setup and customize the theme to meet your exact needs. If you're looking for a fashion ecommerce theme that just oozes style, take a look at the X Store Virtuemart template we have created at the website which comes with everything you need to open a shop. The X Store Joomla ecommerce template is designed to engage your shopper’s attention with its eye-catching slideshow and its crisp, clean store layout which provides your website visitors with a complete shopping experience. The X store shopping cart theme like all the templates we have created at the website is easy to setup and customize plus is also comes with all the features and functionality you need to create a website. The X Store design supports a choice of six colour styles for you to choose from, Product slider modules, over 600+ Font Awesome icons, customer testimonials, custom styles for the K2 extensions and a powerful built-in theme customizer that makes customizing the design a simple task. Create a beautiful website today with the X Store web design. 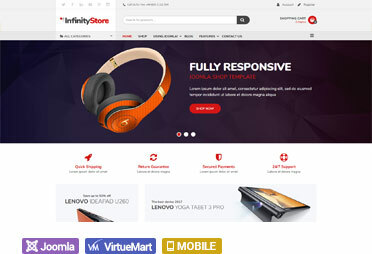 Infinity store is a gorgeous Virtuemart template we have designed at the website for the latest version of Joomla to help you open a shop and sell more products online. Its stylish, minimalist design makes it the perfect shopping cart Joomla template to showcase your products and drive more sales to your website. The impressive homepage features include a stunning image slider, a product carousel, an eye-catching mega menu and the ability to link directly to product categories. This makes it super-easy for your visitors to navigate your website and buy the products you have available for sale. The Infinity store is also easy to setup and customize and comes with everything you need to create a website. Infinity store supports a choice of six modern colour styles for you to choose from, eye-catching Product slider modules, over 600+ Font Awesome icons, customer testimonials, custom styles for the K2 extensions and a powerful built-in theme customizer. Give your website a fresh new look this new year with the Infinity store design. 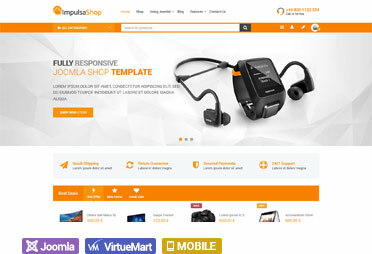 Impulsa is a clean, minimal and highly versatile Joomla shop template we have designed for the latest version of Virtuemart which you can use to build an ecommerce website that will draw more customers to your business. With its simple layout and countless theme tools and options, you get unlimited design possibilities for your online store. Impulsa is a fully responsive design which looks great on different types of devices such as desktop, tablet or mobile phones to provide your website visitors with an enriched mobile friendly shopping experience. Impulsa also comes with an array of built-in features including a choice of modern colour styles for you to choose from, eye-catching Product slider modules, 600+ Font Awesome icons, customer testimonials module, custom styles for the K2 extensions and a powerful built-in theme customizer to provide you with total control to create a unique shop for your business. 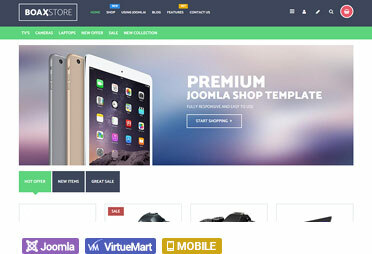 Q Store is a clean, minimal and highly versatile Joomla shop template we have designed for the latest version of Virtuemart which you can use to build an ecommerce website that will draw more customers to your business. With its simple layout and countless theme tools and options, you get unlimited design possibilities for your online store. Q Store is a fully responsive design which looks great on different types of devices such as desktop, tablet or mobile phones to provide your website visitors with an enriched mobile friendly shopping experience. Q store also comes with an array of built-in features including a choice of modern colour styles for you to choose from, eye-catching Product slider modules, 600+ Font Awesome icons, customer testimonials module, custom styles for the K2 extensions and a powerful built-in theme customizer to provide you with total control to create a unique shop for your business. 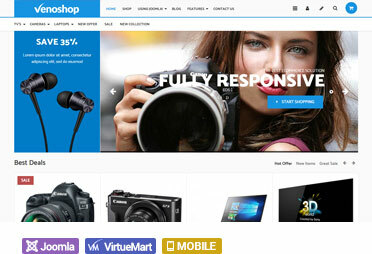 Veno shop is a clean, modern, fully responsive Virtuemart template we have designed at the website for the latest version of Joomla which is a great choice of design for creating a visually stunning Mobile friendly ecommerce website for your business. Veno shop like all the Joomla shop templates we have created at the website is easy to setup and customize plus it comes with everything you need to showcase and sell your products online. Some of the built-in features the Veno shop theme supports include a choice of six unique colour styles for you to choose from, modern image slideshow, Product slider modules, 600+ Font Awesome icons, customer testimonials module, custom styles for the K2 extensions and a powerful built-in theme customizer. If you’re looking for a hand-crafted web design that comes with everything you need to create a beautiful e-commerce website download Veno shop today. Boax store is a beautifully designed Joomla shopping cart template for Virtuemart we have created at the website which comes with everything you need to build a professional, mobile friendly shop for your business. Boax store's hand crafted, fully responsive layout makes your website look amazing on all desktop, tablet and mobile phones. It also easy to setup and customize plus it comes with all the powerful built-in features you expect to see from the high-quality web designs we create at the website. Some of the great built-in features Boax store supports include an easy to use image slideshow, customer testimonials, choice of over 60 flexible module positions for you to choose, an eye-catching mega menu, full RTL layout support and a built-in theme customizer that enables you to easily customize the template.